It didn’t take too much time for the new fresh update to arrive so we are thrilled to introduce you to the upgraded document similarity checker for Google Docs. 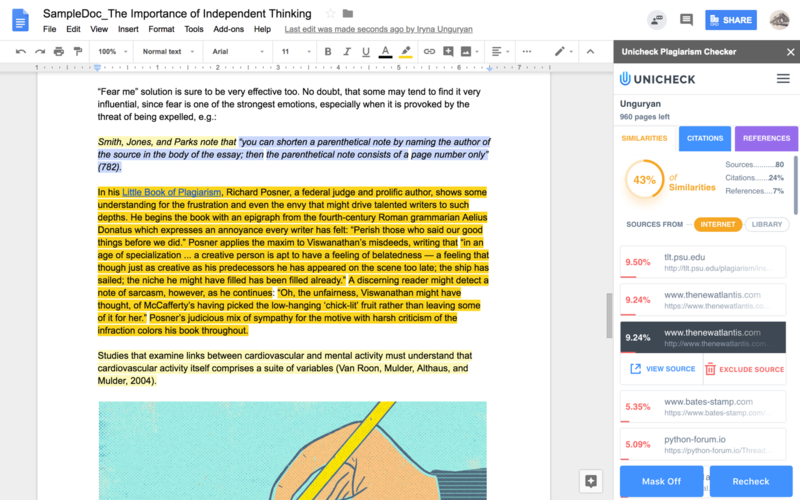 The latest improvement has literally turned the add-on into the most robust writing and editing solution for GDocs. Striving to ensure that add-on always works seamlessly, we went through series of renovations, transformations, and developmental stages. This time, we channeled our persistent efforts towards the release of such fundamental convenience feature as color mask that highlights the similarities, citations and references right in the document. In the past couple of years Google has developed an effective “plug-in” strategy that customizes any workplace, making it perfectly functional for every single user. Various industries along with education and business sectors quickly migrate from tried-and-true text editors to the cloud-based, adaptable GDocs that has add-ons, using which you can create your very own cozy “writing suite”. Analyzing the feedbacks and suggestions of our beloved customers, we found out that the majority of you foresee the great potential in similarity checker add-on with a color mask as it helps to see the document’s structure and refine it right here and now. As we got the gem ready for your eyes, we are happy to let you discover new ways, using which you can use similarity checker Gdocs Addon and make your work inside GDocs substantially more efficient and productive with a new feature. 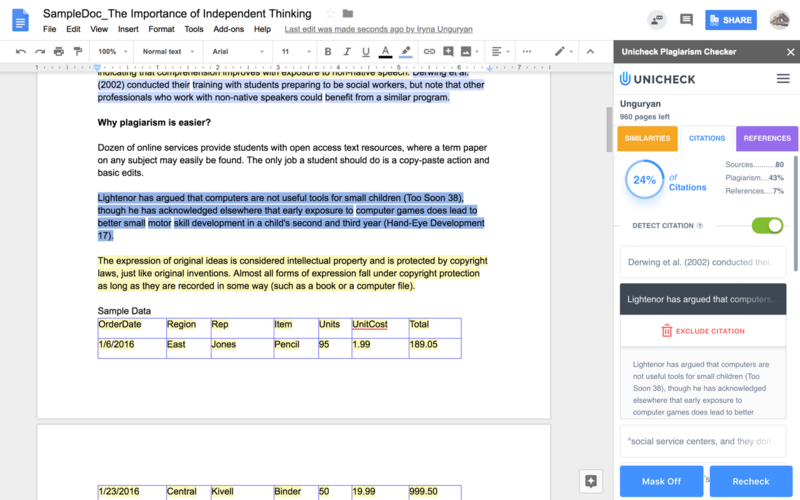 Unicheck Google Docs add-on is already regarded as one of the most reliable and unbeatable product for the document originality checking inside Google Docs, now it’s also packed with a descriptive color mask. See what editing opportunities this novelty holds for you and how you can ace the process of Google Document revision. The color mask now appears all across your Google Document as soon as the check is done. Undoubtedly, the greatest value of such feature is an ability to edit your sentences containing similarities, so if you forget to cite or reference the sources during the writing, finding them is no longer a problem. Just track the sentences highlighted in yellow, acknowledge them in the proper way, applying appropriate format for citing and referencing and hit “Recheck” to stay assured that your document is plagiarism-free. As color mask traditionally includes the references and citations, they also will be highlighted in blue and violet colors all over the document. You are free to include and exclude citations in the document, turn references recognition off and on the same way as in standalone version. To disable the references detection go to the “References” tab and turn off the switcher. To exclude citations from the featured list click on “Citations” tab, turn the detection switcher off or exclude them individually, by clicking on the target citation. All the reports generated by the document similarity checker can be found in the dashboard of the personal standalone account, no matter whether you decide to delete your GDoc document in the future or keep storing it in the Drive. Unicheck plagiarism checker addon is the great invention that helps to speed up and ease the writing and editing routines inside the Google Docs. With the color mask applied to the whole document, one doesn’t need to switch between tabs or hectically look for the similarity sentences throughout the document as they all get highlighted in place. There’s no end for improvements, as Unicheck team says. So in addition to the new updates and handy functions, a whole package of useful features is lined up for the launch in the nearest time. Stay tuned!